Your gates are first thing everybody notices about your home and your property. If you make a wise choice with your front gate then you cannot go much wrong with the rest of your place. How come? Well simply because people tend to make their first impressions within initial few seconds after exposed to certain stimuli. When individuals come to your home and initially spot amazing looking wood gates, iron gates, wrought gates or some other great looking type of gate then in fact this is impression they will be stuck with in reference to your home and quite often even you. Another very important reason why you wish to treat your home with great looking gate is to invest in your property long run. 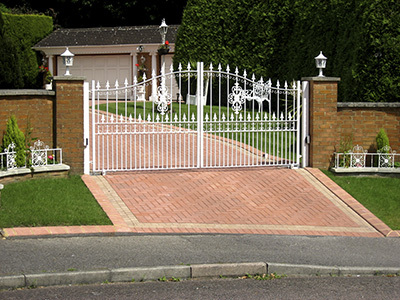 What do we mean by this is that investing into great looking and highly functional gate is type of investment that will pay off on many different levels: you will get to enjoy great looking gates, you will get to enjoy perfectly functioning gates; you will get to enjoy security provided to you by your great gates and at the same time you will get to increase your property’s value due to idyllic look your properly will acquire thanks to nice looking gate. One person that might be of great help to you with the ability to fully grasp this situation for what it is, is your gate contractor. Make sure you seek his/hers advice before you make any kind of significant decision with reference to your gates. Gates do call for some bigger money investing and therefore you do not want to throw your money away or recklessly spend it just because you were impatient or imprudent. It is definitely not worth your money or your nerves to approach gate purchasing unprepared when today you have all the necessary resources on your side that might help you get the prefect gate under perfect conditions. Get all the info ad then get the gate!